Oh, what a grim old day it was. It was only early afternoon on what had started as a bright September morning, but already the light was bleakly fading out for the night as the grey drizzle intensified. 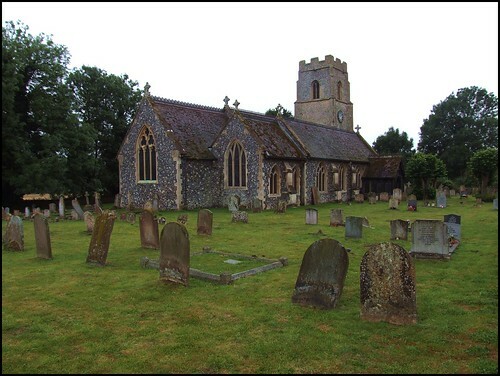 We came to Ickburgh knowing it might well turn out to be the last church of the day unless the weather improved. The village is well-known enough, not least among fans of real ale, for the Iceni Brewery stands on a lane on the other side of the Swaffham road, but St Peter is down a narrow lane which apparently leads nowhere. In fact, it heads into the British Army's battle training area, which live firing has made off-limits to the likes of you and me for almost seventy years now. The neighbouring village of Langford was unfortunate enough to find itself behind the fence, and the church there, barely half a mile from this one, is now within the zone. At one time, you could travel down this lane to the villages of Stanford, home to what is now England's loneliest church, and on to Tottington and West Tofts; but they are all lost to us now. A row of almshouses opposite the church are decorated with Biblical texts, and a farm stands behind the church. It would all be charming and typical rural south Norfolk, if it wasn't for the fact that the farmyard is being built over with suburban houses, a legacy of the difficulties of English agriculture over the last few years.At first sight, St Peter appears no different to a hundred other rural medieval churches in the eastern counties, but the extension to the north aisle gives pause for thought, and then the eye takes in the lavish elaboration of window tracery and roof line. Someone has spared no expense. Only the tower appears still conventionally rustic, perhaps because it is in fact the only medieval survival here. The rest of the church was entirely rebuilt in the middle years of the 1860s. You step into an interior which is like a time capsule of that decade: nothing has happened here since. The glass, the furnishings, the marble pulpit and font, are all of a piece. The glass depicts Evangelists and Doctors of the church. An extraordinarily grand brass Gothic retable has been added to the base of the east window below the altar with room for six big candlesticks, suggesting that this was a very High Church congregation in the 1860s, if not positively Anglo-catholic: if so, this would be an extremely early manifestation for Norfolk, although neighbouring West Tofts was rebuilt just before this in a fantastic medievalist style by Augustus Pugin, and nearby Mundford would also embrace the tradition later in the century. I couldn't help comparing the interior with that of Brome in Suffolk, similarly rebuilt and on a similar scale, but which has benefited from a massive restoration in the last couple of years. It wasn't just the weather: there was something sad about the interior of Ickburgh church, but it might easily be made lovely with a bit of care and attention, and a lot of money. An intriguing relic stands propped up on the window sill of the vestry. It is a framed list of the Rectors of Langford, the parish just beyond this one in the battle training area. It was probably made up in the late 19th century, when Anglican parish churches were finding ways to bridge the divide of the Reformation after years of teaching that it had been a good thing. The list was obviously rescued from Langford church when it was abandoned to war training. I looked at it, and thought of the machine gun holes in the west window at Langford church which I had seen some four years ago. In a curious way, of course, Ickburgh does not seem much less of a backwater than its erstwhile neighbour.